Banking in its modern sense evolved in the 14th century in the rich cities of Renaissance Italy but in many ways was a continuation of ideas and concepts of credit and lending that had its roots in the ancient world. In the history of banking, a number of banking dynasties—notably the Medicis, the Fuggers, the Welsers, the Berenbergs, and the Rothschilds—have played a central role over many centuries. 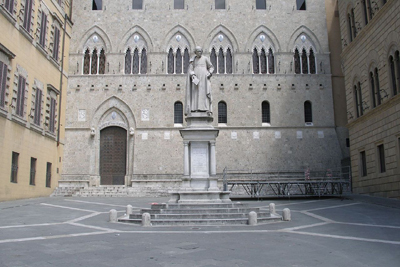 The oldest existing retail bank is Monte dei Paschi di Siena, while the oldest existing merchant bank is Berenberg Bank. Apps That Make Saving as Effortless as Spending - The New York Times. How Citigroup Escaped Financial Disaster in 2008 - The New York Times. Lehman Brothers collapse: where are the key figures now? - "Ten years ago this weekend the investment bank’s bankruptcy caused panic in US and UK." Swiss Leaks - name of a journalistic investigation, released in February 2015, of a giant tax evasion scheme allegedly operated with the knowledge and encouragement of the British multinational bank HSBC via its Swiss subsidiary, HSBC Private Bank (Suisse).